Assess the suitability of a different property in Haiti for the King Center and Project Living Hope activities in Haiti. Assess the needs of the community where the property is located. Meet with local officials and the community and determine the community openness to the project and their willingness to be involved. Start the purchase process for the land. Perform an initial boundary survey of the land and mark the boarders. Bring back aerial and ground imagery of the property and surrounding area. Meet with people in Haiti that can help with and be a part of Project Living Hope in Haiti. The land that we had previously identified in Fonds Parisien for the King Center was occupied by multiple farmers and we were unable to come to a solution for the acquisition of the property that was fair and equitable to all involved. After trying to resolve this for a couple of years, we realized that God may be leading us elsewhere. The new location for the King Center needed to be in a rural area near a major highway, easily accessible, and centrally located for the bulk of Haiti yet within easy access of Port-au-Prince and other urban areas of Haiti. It needed to be out of a flood zone, away from the coast while being large enough and flat enough for the King Center and associated structures. On a previous trip, Guesly looked at several potential properties and the one that rose to the top was near Camp Marie. Camp Marie is a small town located on Route Nationale #1 which is a well-maintained highway and the major route between Port-au-Prince and Cap Haitien. It goes through Saint-Marc and Gonaives, both large cities. It is 48 miles northwest of Port-au-Prince, six miles southwest of Saint-Marc and about five miles behind large hills from the ocean. Upon arrival, we traveled from Port-au-Prince to Camp Marie and met with the current land owners. They took us to visit the property. We traveled on a twisting, narrow, rutted road past a church, homes, children playing in yards and goats tied along the road grazing. What struck me was that there are large trees in Haiti! The area around Camp Marie is lush with large trees, banana and plantain fields, and hedgerows along the paths. 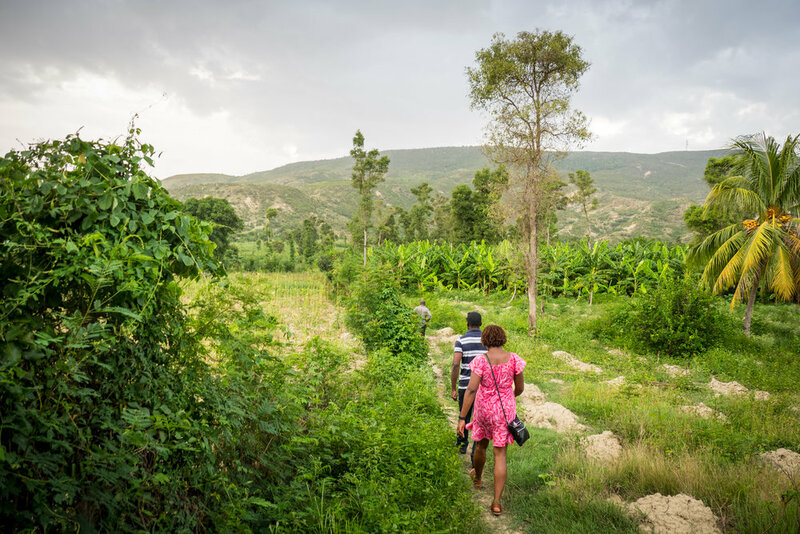 There is a lot of agriculture with a rudimentary network of irrigation ditches in the area; there is some of the best soil that I have seen in Haiti. We traveled down this road for half a mile and then continued on foot for another half mile to the property. (They took us the long way this time.) The property is only about 900 yards northwest of the center of Camp Marie. As we made it to the southeast corner of the property I was struck by how lush the property was with plantain and palm trees, corn, okra and peppers growing between the trees. We attracted the attention of the surrounding farmers and soon we had quite a group accompanying us on our exploration of the property. The property is cradled in low lying area with hills protecting it on three sides. It is relatively flat and there aren’t any streams nearby to cause flooding concerns. The land seemed to be quite acceptable for Project Living Hope’s use. By this time it was threating rain and getting dark, time to go to our room and get ready for tomorrow. Today we went into Saint-Marc to meet with the people involved with the selling and buying land. Saint-Marc is a vibrant bustling city that is cleaner than Port-au-Prince. Our meetings were informative and fruitful. We met up with the surveyors and traveled back to the property to mark the boundary with signs and survey tape. As usual in Haiti, there were lots of people helping. We marked each corner with sticks, marking tape and accurate GPS coordinates. We chopped through the foliage with machetes in the lower part of the property like in an old jungle movie and climbed up the hills to the west marking the property boundary. Our objective was to mark out 22 acres. Despite the surveyors' careful measurements and diligent calculations, subsequent GPS mapping showed that we ended up with 33 acres. We indicated that the hillside would not be useful to us and the following day they resurveyed the western boundary to give us 22 acres. We started day three by meeting with a local soccer coach and team and visiting the community soccer pitch, one of the nicest that I have seen in Haiti. Everyone gets in the action...including the local livestock! Of course, there are consequences of having livestock on the Futbol pitch. After this we went to the property to take aerial images of the property and surrounding area with a small drone. The property is just as amazing from above. Here is an arial view of the land and boundary lines. We took hundreds of drone images and many movies.This helped us get an idea of the land and the surrounding hills. After the drone batteries were depleted, we headed to the main part of town and met with the community magistrate Marie Lourdes and a couple of the local council members. We explained what Project Living Hope was and how we hoped to partner with the community. They asked many thoughtful and hard questions and in the end, they are excited about working with us. We next had a community meeting where anyone could come and find out about Project Living Hope, the King Center and how we want work with the community. We had a great turnout with lots of interest, probing questions and even animated discussions. In the end, there is overwhelming support for this project from the community. So much so that they are willing to build a road for us all of the way to the property by the end of December! The next step is for Guesly and his cousin (and PLH board member) Pierre to finalize the purchase of the property. Then we will need to send a team to do a topographical survey of the property and accurately and permanently mark the corners and boundary. We will continue developing our presence in the community and establish a permanent presence in Haiti. We are assessing our needs for a wall or fence around the property. We are also assessing the needs of the community for a vocational training center. There is lots to do and everyone’s support is vital. Thank you. This is a great location for the King Center and for Project Living Hope to plant in Haiti. For me, the trip helped bolster my enthusiasm and excitement for the project and as usual the most important part of the trip was in the relationships that we made along the way. I’d like to thank Betty Descieux, board member Pierre Jr. Descieux's wife who grew up in the area near Camp Marie. Her knowledge of the region and tenacity helped us achieve so much. Also Thonny Fabien for working with us and making sure everyone is on the same page and for his unwavering support of PLHope. Herold Simeon for driving us, getting us where we needed to go and keeping us safe, and to many others whose names I cannot remember or pronounce. I truly believe that God has led us to this new place and I’m excited to move forward with this community, these great people and this wonderful location.